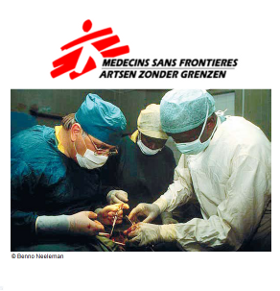 Médecins Sans Frontières (MSF) is an international, independent, medical humanitarian organisation that delivers emergency aid to people affected by armed conflict, epidemics, healthcare exclusion and natural or man-made disasters. The work of MSF is carried out by thousands of health professionals, logistical and administrative staff. The vast majority of MSF staff come from the countries where the organization provides medical assistance. Together, they manage projects in more than 60 countries worldwide. MSF has surgical activities in general health care projects, in emergency interventions (ranging from surgery in emergency field hospitals to involvement in third-level referral structures), and in specific projects, e.g. obstetric surgery. You will find more information on the website: www.msf.org. In the aftermath of the 2004 Indian Ocean tsunami, 2005 Pakistan Earthquake, 2010 Haitian earthquake, SICOT and MSF started a collaboration, aiming at the improvement of surgical / orthopaedic care in emergency situations. Thus, taking advantage of SICOT's network of highly qualified orthopaedic surgeons and traumatologists, as well as MSF's experience and knowledge of emergency medical care. Members undertake to respect their professional code of ethics and to maintain complete independence from all political, economic, or religious powers. Life Saving Surgery: generally performed for an acute surgical state in which the patient’s life / vital organ / limb is at stake and which needs to be done as soon as possible, usually within a few hours. In this situation, the benefit of performing the surgical intervention outweighs the risk and justifies proceeding with the surgery even if all other conditions are not ideal. E.g. wound debridement, traction (skin and skeletal), close reduction with PoP, amputation. In these situations, application of external fixation in open fractures may be applicable as part of this procedure. Essential Surgery: addresses a condition amenable to a proven surgical treatment which may not affect health / life immediately, but considerably impairs the quality of life and / or may present a serious health threat in the future. E.g. tendon repair, skin grafting, flaps for wound coverage. When hygiene control conditions are met, application of internal fixation in close fractures may be performed. More specific information is available in our members area or to contact MSF directly they can be reached at Medical.Fieldrecruitment@brussels.msf.org.